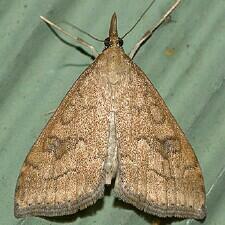 False Celery Leaftier, photo ©John Davis, North American Moth Photographers Group. An indeterminate inflorescence that has a greatly reduced central axis, such that the flowers appear to originate from the same point, usually resulting in a flat- or round-topped inflorescence, with a sequence of flowering from outside to inside. A raised portion on the visible part of a scale of a seed cone. Without spines, prickles or thorns. Hooked at the tip (as in a hair). Wavy-margined but without prominent teeth. A flower that bears only carpels or stamens. Obligate Upland: plant may occur in wetlands outside of New England, but occurs almost always in non-wetlands in New England (probability > 99%). A specialize type of achene that is a small, thin-walled, one-seeded, inflated fruit.